See the hyperaldosteronism-related images below. 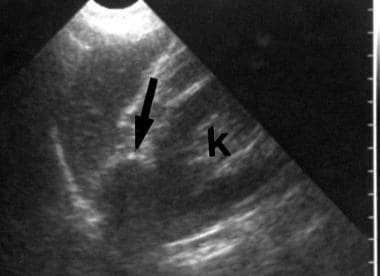 Longitudinal sonogram through the left kidney in a 32-year-old woman who presented with hypertension shows a 3-cm hypoechoic but solid mass superior to the upper pole of the kidney. 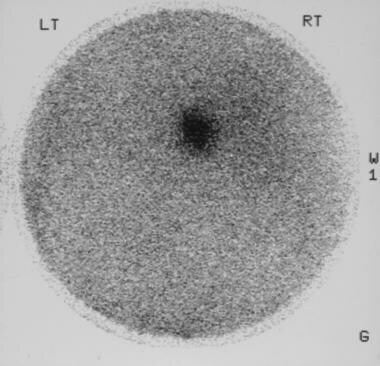 Initially, the mass was regarded as a nonfunctioning adenoma unrelated to the patient's hypertension. Subsequently, mild hypokalemia developed. Surgical resection confirmed a tumor due to Conn syndrome. Axial enhanced CT scan in a 32-year-old woman who presented with hypertension shows a low-attenuating 2.8-cm suprarenal mass (A) (same patient as in previous image). Histologic results obtained after surgery confirmed a tumor due to Conn syndrome. 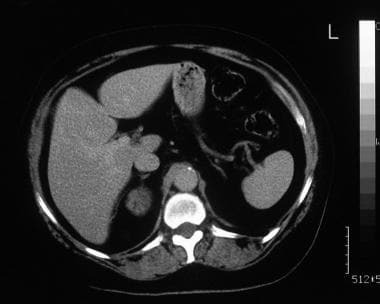 Axial nonenhanced CT scan through the adrenal glands in 56-year-old man shows multiple nodules in both glands, although biochemical results indicated primary aldosteronism. The patient received medical treatment. 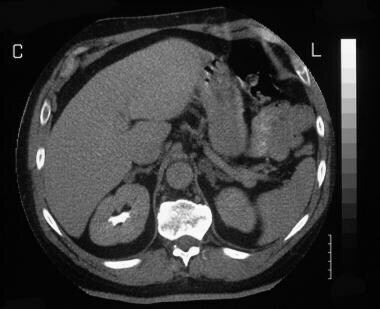 Axial enhanced CT scan in a 56-year-old man shows no enhancement of the adrenal masses (same patient as in the previous image). Plain radiographs have no significant role. Ultrasonography has little to contribute unless the adrenal tumor is large, which is seldom the case. However, ultrasonography is an excellent modality for the investigation of hypertension. Hypersecreting adrenal glands may appear to be normal in size on images, because the size of the adrenal gland may be compared to a normal measurement and because the healthy adrenal gland varies considerably in size. The adrenal glands also vary in size and weight as a result of illness or stress. This size discrepancy is a particular problem with aldosterone-producing adenomas (APAs), because they are often small and difficult to detect. In one series, the average diameter of an APA was 18 mm, and 20% of tumors were smaller than 1 cm. Primary aldosteronism, also termed Conn syndrome, is clinically characterized by hypertension and hypokalemia. Primary aldosteronism was first described in 1955 as a syndrome related to the hypersecretion of aldosterone by an adrenal adenoma. Although primary aldosteronism accounts for 0.05-2% of cases of hypertension in the general population, recognition of the disease is important because patients readily respond to the removal of the adrenal gland tumor. 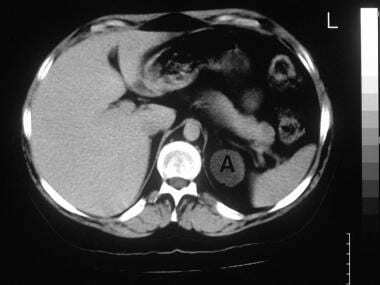 The most common cause of primary aldosteronism is an adrenal adenoma; most of the remaining cases result from adrenal gland hyperplasia. Adrenal carcinoma is an extremely rare cause of primary aldosteronism. In 75-90% of patients with a solitary aldosterone-producing tumor, surgical adrenalectomy corrects the hypertension and hypokalemia. The midsections of the gland present a Y -shaped configuration. Occasionally, the anteromedial ridge is small or not well developed, resulting in an inverted, V -shaped gland. The normal adrenal limbs measure 3-6 mm in thickness, 4-6 cm in length, and 2-3 cm in width. The variation in size explains why some hyperfunctioning glands are seen to be normal in size on images and at surgery. See the CT images below. 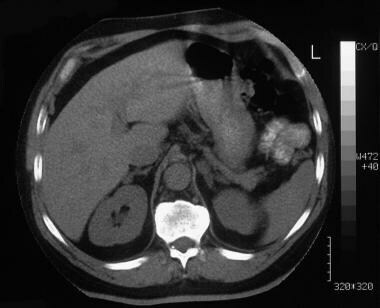 Axial nonenhanced CT scan through the adrenal glands in a 60-year-old patient who presented with hypertension and hypokalemia shows a bilobulated tumor in the right adrenal gland. Axial enhanced CT scan through the adrenal glands in a 60-year-old patient who presented with hypertension and hypokalemia shows minor tumor enhancement (same patient as in previous image). Note the normal left adrenal gland. A 59-year-old man was referred for renal ultrasonography as a part of the workup for newly diagnosed hypertension. The sonogram depicted a 3-cm right adrenal mass, which was regarded as an incidentaloma (not shown). 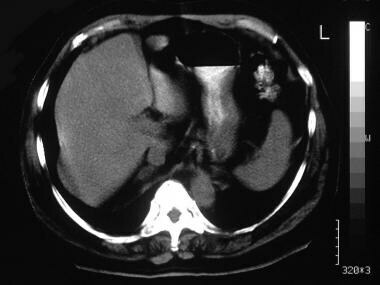 Axial enhanced CT scan through the adrenal gland shows minor patchy enhancement in a right adrenal tumor. The mean attenuation level in adrenal adenomas is -2.2 HU. Among hyperfunctioning adenomas, aldosteronomas have the lowest attenuation levels. In patients with primary hyperaldosteronism, CT scan findings may be normal, or scans may show nodular or multinodular glands. CT scanning has a sensitivity of 60-80% in detecting aldosterone-producing adenomas (APAs). CT appears more reliable at revealing tumors larger than 1 cm. Conversely, 20% of tumors may be missed. In one series, the average diameter of an APA was 18 mm, and 20% tumors were smaller than 1 cm. 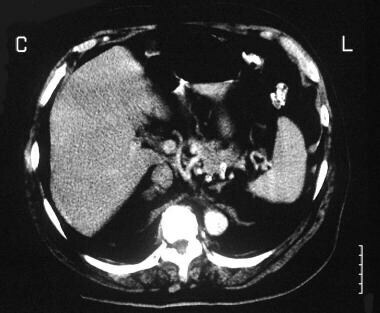 CT scan findings of ipsilateral or contralateral, nonfunctioning adenomas lead to a false-positive diagnosis of adrenal hyperplasia. CT scanning is not reliable in distinguishing hyperplasia from adenoma in patients with multiple, bilateral nodules. Early experience with MRI in the diagnosis of aldosterone-producing adenoma (APA) has been encouraging. APAs are isointense or hypointense relative to the liver on T1-weighted images; they are slightly hyperintense on T2-weighted images. Ultrasonograms may reveal a significantly sized aldosterone-producing adenoma (APA), but because APAs tend to be small, the overall sensitivity of ultrasonography is poor. Compared with the adrenal tumors in Cushing disease, larger APAs are easier to identify, because neither retroperitoneal nor subcutaneous fat is obtrusive, as it is with Cushing disease. Ultrasonographic findings contribute little to the diagnosis unless the adrenal tumor is large, which is seldom the case. However, ultrasonography is an excellent modality for the investigation of hypertension. The exact sensitivity of ultrasonography in the diagnosis of APA is not known, but it appears to be low. Similar to other types of cross-sectional imaging, ultrasonography may incidentally demonstrate nonfunctioning masses in the adrenal glands. Scintigram obtained by using iodine-131-6-beta-iodomethylnorcholesterol (NP-59) in a 59-year-old man with hypertension shows fairly intense radionuclide uptake in the right adrenal tumor. At surgery, a Conn tumor was confirmed. Because aldosterone-producing adenomas (APAs) are small and are not usually vascular, selective adrenal angiography is seldom helpful. However, adrenal phlebography has a useful role in the investigation of APA, because the splaying of veins around APAs can help in identifying even small tumors. If contrast medium is refluxed into the veins of the APA, a wheel-spoke pattern is seen in the intratumoral veins. Because APAs are small, a vigorous retrograde venous injection is usually required to detect the tumors; this vigorous injection is not without risk, because extravasation may occur. Extravasation is a particular problem if the catheter is wedged into the vein. Extravasation can be painful and has been associated with adrenal infarction. Adrenal vein thrombosis is also a known complication of adrenal phlebography, which has been linked to adrenal infarction. Adrenal insufficiency has been described as a result of bilateral adrenal infarction. Adrenal vein thrombosis is more likely to occur if the catheter is wedged in the adrenal vein and left there for several minutes during the procedure. The most useful technique in the investigation of primary aldosteronism is adrenal venous sampling. [8, 11, 15] Blood samples are obtained from both adrenal veins for aldosterone level analysis; hormone level ratios are compared with each other and with levels in the inferior vena cava below the adrenal veins. In experienced hands, this technique can achieve a high sensitivity; however, it is a time-consuming procedure that necessitates prolonged cannulation of adrenal veins and increases the risk of adrenal vein thrombosis. In addition, the adrenal veins are small, and collecting 7 mL of blood for sampling is not easy. This is particularly a problem when blood is collected from the right adrenal vein, in which a short vein enters the inferior vena cava directly. Some venous samples thus acquired may be diluted by blood from the inferior vena cava on the right and from the phrenic or renal vein on the left. To overcome the problem of dilution, cortisol levels can be measured from the same samples. A low cortisol level suggests dilution by nonadrenal blood, whereas a high cortisol level indicates a relatively pure sample. When aldosterone and cortisol are measured in blood samples from the same site, an aldosterone-cortisol ratio that corrects the concentration of aldosterone for dilution can be calculated. Zarnegar and colleagues conducted a study of 59 patients with hyperaldosteronism who underwent unilateral adrenalectomy  on the basis of CT scan alone (n=30) or CT scan and adrenal venous sampling (n=29), and the authors found that adrenalectomy had similar clinical effects in the 2 groups. CT scanning can be used to reliably diagnose adenomas larger than 1.0 cm. The authors recommended that adrenal venous sampling be reserved for cases in which CT scan findings are equivocal or in which both of the patient's adrenal glands are abnormal. The dilution of blood from the inferior vena cava on the right and from the renal or phrenic vein on the left can lead to erroneous results in adrenal venous sampling. Mayo-Smith WW, Boland GW, Noto RB, et al. State-of-the-art adrenal imaging. Radiographics. 2001 Jul-Aug. 21(4):995-1012. [Medline]. [Full Text]. Gallay BJ, Ahmad S, Xu L, et al. Screening for primary aldosteronism without discontinuing hypertensive medications: plasma aldosterone-renin ratio. Am J Kidney Dis. 2001 Apr. 37(4):699-705. [Medline]. Mathur A, Kemp CD, Dutta U, Baid S, Ayala A, Chang RE, et al. Consequences of adrenal venous sampling in primary hyperaldosteronism and predictors of unilateral adrenal disease. J Am Coll Surg. 2010 Sep. 211(3):384-90. [Medline]. [Full Text]. Stowasser M, Taylor PJ, Pimenta E, Ahmed AH, Gordon RD. Laboratory investigation of primary aldosteronism. Clin Biochem Rev. 2010 May. 31(2):39-56. [Medline]. [Full Text]. Raman SP, Lessne M, Kawamoto S, Chen Y, Salvatori R, Prescott JD, et al. Diagnostic performance of multidetector computed tomography in distinguishing unilateral from bilateral abnormalities in primary hyperaldosteronism: comparison of multidetector computed tomography with adrenal vein sampling. J Comput Assist Tomogr. 2015 May-Jun. 39 (3):414-8. [Medline]. Asmar M, Wachtel H, Yan Y, Fraker DL, Cohen D, Trerotola SO. Reversing the established order: Should adrenal venous sampling precede cross-sectional imaging in the evaluation of primary aldosteronism?. J Surg Oncol. 2015 Aug. 112 (2):144-8. [Medline]. Graham U, Ellis P, Hunter S, Leslie H, Mullan K, Atkinson A. 100 cases of primary aldosteronism. Careful choice of patients for surgery using adrenal venous sampling and CT imaging results in excellent blood pressure and potassium outcomes. Clin Endocrinol (Oxf). 2011 Jul 18. [Medline]. Magill SB, Raff H, Shaker JL, et al. Comparison of adrenal vein sampling and computed tomography in the differentiation of primary aldosteronism. J Clin Endocrinol Metab. 2001 Mar. 86(3):1066-71. [Medline]. [Full Text]. Nocaudie-Calzada M, Huglo D, Lambert M, et al. Efficacy of iodine-131 6beta-methyl-iodo-19-norcholesterol scintigraphy and computed tomography in patients with primary aldosteronism. Eur J Nucl Med. 1999 Oct. 26(10):1326-32. [Medline]. Hwang I, Balingit AG, Georgitis WJ, et al. Adrenocortical SPECT using iodine-131 NP-59. J Nucl Med. 1998 Aug. 39(8):1460-3. [Medline]. [Full Text]. Rossi GP, Sacchetto A, Chiesura-Corona M, et al. Identification of the etiology of primary aldosteronism with adrenal vein sampling in patients with equivocal computed tomography and magnetic resonance findings: results in 104 consecutive cases. J Clin Endocrinol Metab. 2001 Mar. 86(3):1083-90. [Medline]. [Full Text]. Rossi GP, Chiesura-Corona M, Tregnaghi A, et al. Imaging of aldosterone-secreting adenomas: a prospective comparison of computed tomography and magnetic resonance imaging in 27 patients with suspected primary aldosteronism. J Hum Hypertens. 1993 Aug. 7(4):357-63. [Medline]. Sohaib SA, Peppercorn PD, Allan C, et al. Primary hyperaldosteronism (Conn syndrome): MR imaging findings. Radiology. 2000 Feb. 214(2):527-31. [Medline]. [Full Text]. Nunes TF, Szejnfeld D, Xavier AC, Kater CE, Freire F, Ribeiro CA, et al. Percutaneous ablation of functioning adrenal adenoma: a report on 11 cases and a review of the literature. Abdom Imaging. 2013 Apr 16. [Medline]. Nishikawa T, Saito J, Omura M. Adrenal venous sampling is absolutely requisite for definitively diagnosing primary aldosteronism as well as for detecting laterality of the adrenal lesion. Hypertens Res. 2007 Nov. 30(11):1009-10. [Medline]. [Full Text]. Zarnegar R, Bloom AI, Lee J, et al. Is adrenal venous sampling necessary in all patients with hyperaldosteronism before adrenalectomy?. J Vasc Interv Radiol. 2008 Jan. 19(1):66-71. [Medline]. Iacobone M, Citton M, Viel G, Boetto R, Bonadio I, Tropea S, et al. Unilateral adrenal hyperplasia: a novel cause of surgically correctable primary hyperaldosteronism. Surgery. 2012 Dec. 152(6):1248-55. [Medline]. The authors and editors of Medscape Reference gratefully acknowledge the contributions of previous authors Basil Issa, MBBCh, MRCP, and Sumaira MacDonald, MBChB, PhD, MRCP, FRCR, to the development and writing of this article.